It’s been a few weeks since I last reported on our continuing adventures in the mountainous Abruzzo region of Italy. This isn’t because there’s been nothing to report, but I didn’t want to risk boring you by detailing every visit. 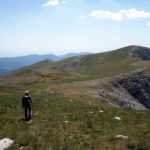 But over the course of two weekends we visited Abruzzo National Park and climbed the four main peaks in the area: La Meta (2242m), Monte Petroso (2249m), Monte Greco (2285m) and Monte Marsicano (2253m). Abruzzo has provided a feast of mountains for us throughout 2015, and although it’s a close call, I think these have been my favourites of all of them. Abruzzo is the region of Italy in the centre of the peninsula immediately east of Rome, around two hours’ drive from the capital. 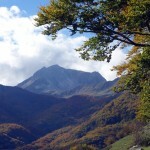 It is home to many of the highest peaks in the Apennines – including the highest Corno Grande (2912m) – mostly contained within three national parks (Gran Sasso, Maiella and Abruzzo) and one regional park (Sirente-Velino). A network of well-managed, paint-marked trails criss-cross the hills, and armed with a good map the options for hill walking are endless. 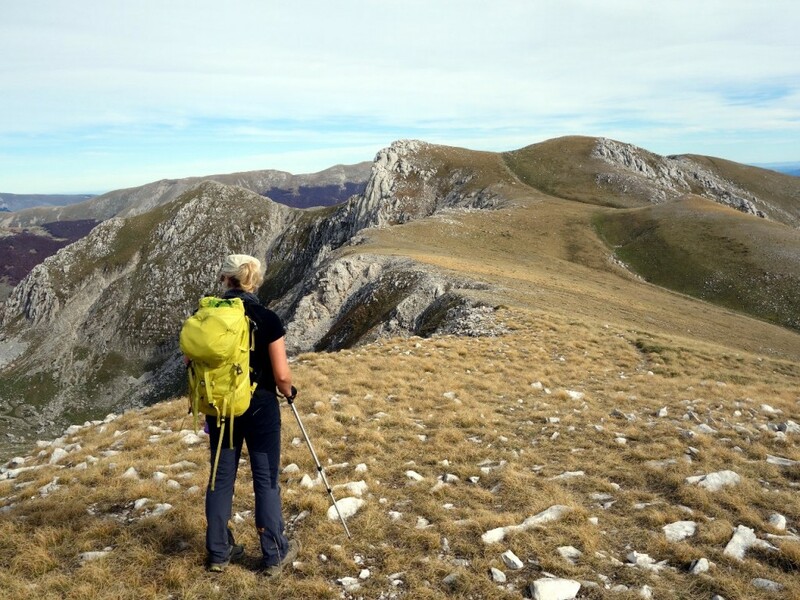 We have climbed the highest peaks in Gran Sasso, Maiella and Sirente-Velino, so it was time to turn our attention to Abruzzo National Park, the lowest of the four parks in terms of altitude, but the most interesting in terms of wildlife. It is home to the critically-endangered Marsican brown bear (known as orso bruno marsicano in Italian), wolves (lupo) and lynx (lince), all of which are difficult to spot (though let’s be honest, this is something of a relief). There are also plenty of chamois (camoscio), red deer (cervo) and roe deer (capriolo) to be seen readily. Its status as the last remaining habitat of the Marsican brown bear means that some areas of the park are closed to visitors, mostly in the summer, to give the bears more opportunity to breed. Autumn is a good time to visit, when the mountains are carpeted in colourful beech forests whose colours change from green to red to brown as they rise in altitude up the hillsides. The heart of the park is centred around Lago di Barrea, a picturesque lake enclosed by wooded hills, and surrounded by three historic villages – Barrea, Villetta Barrea and Civitella Alfedena. It’s a peaceful setting for sure, and one we had no hesitation in returning to on successive weekends. 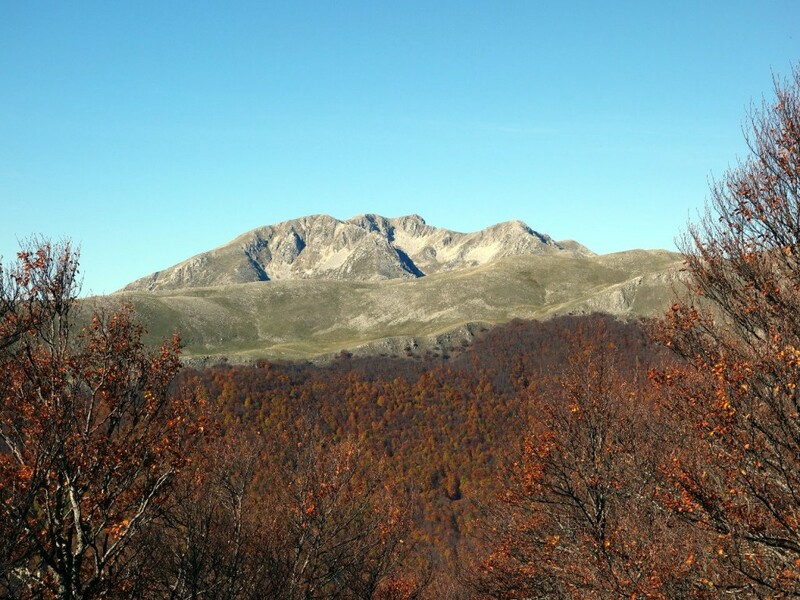 The quartet of peaks we chose to climb can reasonably be regarded as the Big Four of Abruzzo National Park (although one falls just a bear’s growl outside the national park boundary). All of them can be climbed using a single 1:25,000 map published by Edizioni il Lupo. Monti della Meta is a long chain of mountains running from north to south, and containing a number of summits over 2000m. The whole chain is named after the central peak, La Meta. I picked the peak at random from the map because Saturday was forecast to be cloudy, and the ascent appeared to involve a short circular walk from the car park at Rifugio Campitelli (1445m) on its eastern side, up the paint-marked L1 trail, and back down the M1. We started in forest, which was already awash with autumn colours. Parts of the trail were hidden under a fall of wet leaves, and I let Edita lead, as she is better at spotting the red and white paint marks neatly striped on rocks and tree trunks. It was a bit dreary inside the forest, but things became more interesting once we reached the treeline at 1650m. A colourful scene of ash-grey crags covered with red autumn beech forest greeted us, and we could see villages in a broad valley far beneath us. We ascended through emerald moorland, dusted with limestone outcrops. There was plenty of blue sky overhead, but at the top of the valley we were ascending, the striped cliffs of La Meta disappeared into cloud and we expected the summit to be pretty miserable. Sharp-eyed as ever, Edita spotted a herd of roe deer disappearing up a hillside to our left, and as we crossed a boulder field and approached a grassy col on the main Monti della Meta ridge, 300m below the summit, we saw chamois grazing on the slopes above us. It was extremely windy at the col as we turned right and headed into the clouds on the final heave up to the summit. Although the east face of La Meta was guarded by cliffs, the western side of the ridge was gentle and grassy. By good fortune the clouds lifted as we approached the summit, and an amazing scene opened out beneath us. There were four distinct zones, all different colours. On the far horizon the peaks of Maiella were distant and dark, and beneath them stretched a wide plain of green forest, farmland and villages. 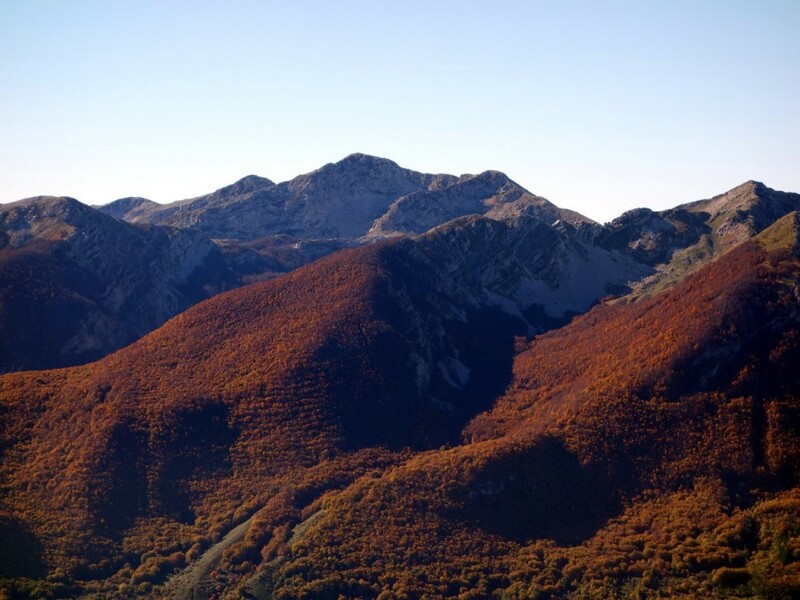 The foothills of Monti della Meta were swathed in a carpet of forest which, unlike the trees in the lowlands, were already displaying their autumn colours of orange and red. Immediately below us a whaleback ridge cut a path through the forest, rising into moorland of lighter green. The limestone outcrops contributed additional splashes of grey. The summit was rocky, and we found a sheltered cove away from the wind, a fantastic place to enjoy a cheese and prosciutto sandwich. We took a different valley down where the forest was thicker. By the time we emerged at the bottom the clouds had risen and it was a beautiful afternoon. You don’t always get a chance to look back on the mountain you’ve climbed from down below, but now we had a fantastic view of the rocky east face of La Meta rising above the forest. 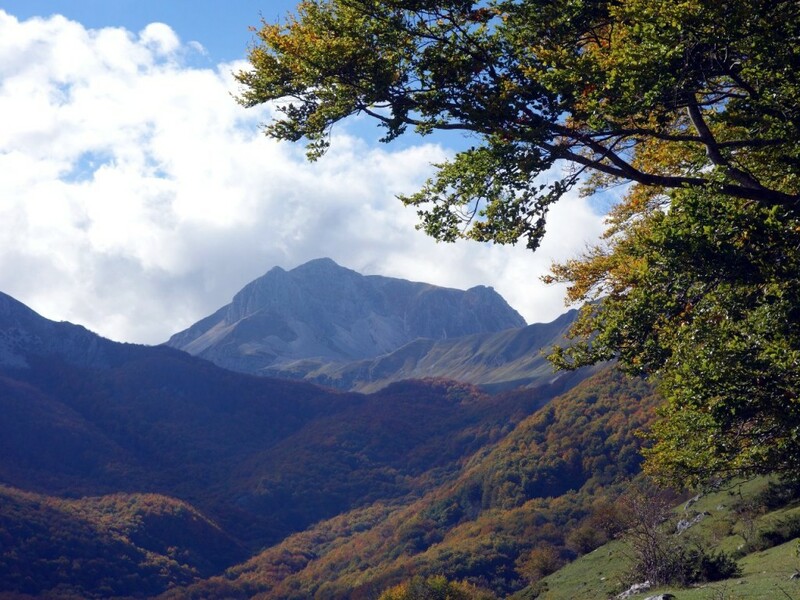 A lovely introduction to Abruzzo National Park. Sunday was forecast to be a better day than Saturday, so we planned to climb Monte Petroso, often described as the highest peak within the national park (though, as you will see, this isn’t true), and one of the northern peaks of the Monti della Meta massif. We awoke to a morning of low cloud, with the summits hidden from view, and the forecast proved to be wrong. The clouds didn’t lift, and only became thicker as the afternoon wore on. This may yet prove to be a blessing in disguise. Like La Meta, Monte Petroso lies within a region of the park designated an Integral Reserve. We passed a red sign on the way up telling us this, but didn’t know what it meant. 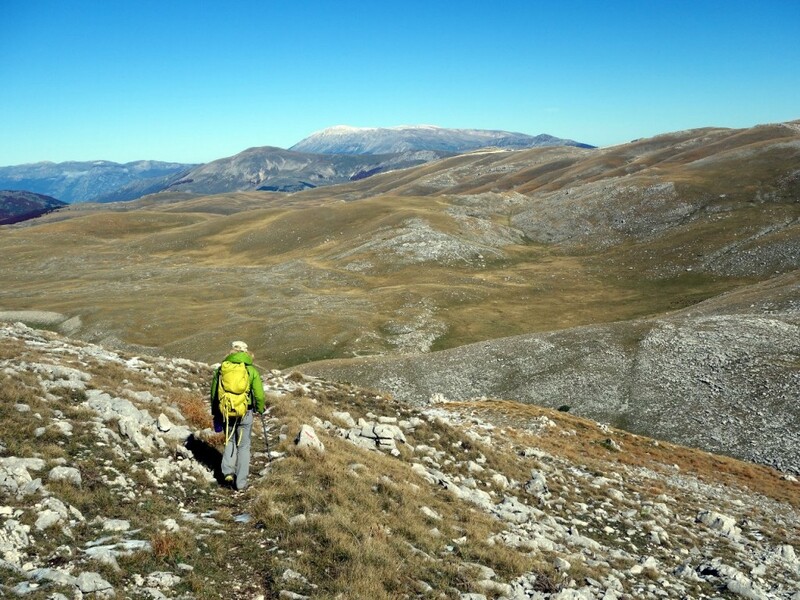 According to my excellent Cicerone guidebook Walking in Abruzzo, the route is closed during July and August, but usually reopens by the second week of September. As we were into October, we happily ignored the sign and continued up. We’ve since discovered access may be limited, but by how much and when remains a mystery. According to Summitpost the route is closed all year. Other sources suggest you can enter the Integral Reserve on paint-marked trails (there is one to the summit of La Meta, but not Monte Petroso) or accompanied by a national park ranger. My limited grasp of Italian has not enabled me to find the answer on the national park website, where the information is ambiguous, but I did stumble across an Italian hikers’ forum which suggested they are as confused about the rules as we are. In any case, at the risk of reinforcing national stereotypes, this is Italy not Switzerland, and rules tend to be for guidance rather than obedience. 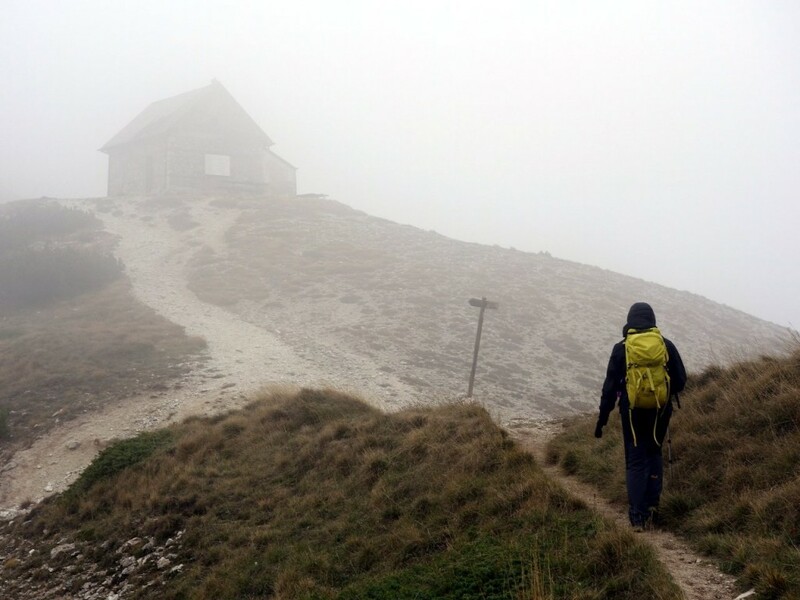 One of the advantages of climbing a mountain in thick mist is that no one can see you, and judging by the forum thread we wouldn’t be the first people to climb Monte Petroso in blissful ignorance of the rules. It wasn’t just park rangers we were lucky to avoid. As we ascended the Valle di Rose on the steep I1 trail from the village of Civitella Alfedena (1100m), we passed regular piles of manure. “Do you think we will see a bear?” Edita said excitedly. It was only after we climbed out of the forest she admitted she had seen a place advertising pony trekking down in the village. The route was popular, and once above the treeline we could see many hikers on the trail above us. We climbed steeply on a winding trail through grassy moorland. We were already in cloud by the time we reached the first pass, Passo Cavuto at 1942m. From here we traversed the mountainside for a short while before reaching a second pass, Forca Resuni, at 1952m. Here the I1 trail ended at a small hut, and a second trail, the K6, descended into a parallel valley, the Valle Jannanghera. This was to be our route of descent, and although the other hikers were turning back, we still had a final 300m of ascent up a ridge to the summit of Monte Petroso. The paint-marked route stopped here, but there was a distinct trail leading upwards. We followed it for about 200m up a broad ridge which ended abruptly at cliffs. A much less distinct trail traversed beneath the cliffs to the right. We could have followed it confidently in clear weather, but visibility was now down to a few metres. In places the trail disappeared completely and the way was marked only by a series of indistinct cairns. We had to look carefully to see them, but I did spot a chamois in the murky foreground not 20m ahead of me. It seemed surprised to see me. The hillside fell away steeply into mist beneath us, and I was much happier once we passed beneath the cliffs and were able to rejoin the ridge. I almost didn’t believe it when we stumbled up a grassy slope and arrived on the summit. Enveloped in thick mist we had no way of knowing if there were any higher peaks around us. Every other summit we’ve climbed in Italy has been marked by a huge metal cross, but Monte Petroso was marked by just a small pile of stones. We only knew for sure it was the summit by some blue paint splashed on a rock bearing the legend “2249m”. I’ve been up countless peaks in Britain where I’ve had no view, but this was the first time it’s happened to me in Italy. But even the mist in Italy is better than ours. You can’t enter a cloud in the UK without being sheeted with water, but this was a peculiarly dry mist that obscured the view but was otherwise pleasant enough. The mist descended down the hillside almost as quickly as we did. It didn’t really matter that we couldn’t see a view, because most of our descent into the Valle Jannanghera was through thick beech forest. Luckily we didn’t see a bear either. Monte Greco actually lies outside the national park boundary, but only just. For various reasons it deserves to be included in the Abruzzo Quartet. It’s the highest peak in this part of Abruzzo, and looks directly across Lago di Barrea to the other big three. It also has, in my opinion, the best view of all of them (yes, OK, I know we didn’t get to see the view from Monte Petroso, but bear with me). 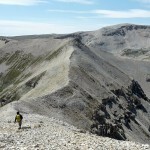 There is no paint-marked trail to the summit of Monte Greco, but unlike Monte Petroso there are no restrictions on access, and the western side is gentle and rolling, so you can pretty much choose your way up. Rather than ascending from Lago di Barrea, we chose a long walk in along the H1 trail from the roadside to the north, near Passo Godi. 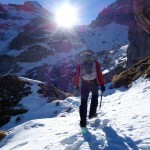 The route began at 1500m, but it involved a lot of up and down, and I estimate that we climbed over 1000m that day. The route was relatively flat for the first 4km as we followed a broad track through forest. Eventually the track ended and we turned to the left to take a direct route up the hillside. The forest was much thicker here, and by the time we reached the treeline we were already at 1800m. We were looking directly south to Monti della Meta, a crumple of rocky peaks rising above the red forest. It was our first view of Monte Petroso, and we were able to trace the route we had followed in the mist the previous Sunday. But by far the most eye-catching mountain was to the east, a triple-pointed crag rising above green hills, looking very like the mountains we have back home. It was Monte Marsicano, and although we had planned to climb La Terratta further to the north, I immediately agreed. Nobody viewing Monte Marsicano from that angle can possibly consider climbing anything else. It was a beautiful sunny day, but as we crested a rolling grassy hillside and looked across a gentle valley to Monte Greco, it became increasingly cold and windy. Both our crest and Monte Greco itself were lightly dusted with snow, but we found ourselves looking across a very different landscape to the forested, rocky hillsides of Monti della Meta and Monte Marsicano to the southeast. Suddenly there were wide open spaces, and we could see for miles. On the horizon Monte Amaro, the principal peak of Maiella National Park, appeared as a giant plateau rising high above the surrounding landscape. It was 500m higher than even Monte Greco, and was unmistakeable. We descended into the valley, and picked a pathless route up the grassy western flank of Monte Greco. On the summit we found ourselves on the very edge of the Apennines, with the land on the other side dropping away to the Adriatic Sea. It was by far my favourite view I’ve had in Italy, and we could see at least six of the mountains we have climbed this year, including 2793m Monte Amaro, 2912m Corno Grande (which we’ve wrestled with not once, not twice, but three times), 2348m Monte Sirente (which we’ve had a go at not once, but twice), 2486m Monte Velino (just the once), and of course 2242m La Meta and 2249m Monte Petroso. The only peak missing from this list was Monte Marsicano, but we could rectify that tomorrow. It was another fantastic hill walk, and it wasn’t ruined when I got back to the car and discovered I’d lost my sunglasses using the stupidly absent-minded method of putting them on the brim of my cap then walking for much of the way back with the cap in my hand, swinging my arms back and forth as I strode through the forest. The village of Opi perches arrestingly on top of a small hill rising above the main road back from Abruzzo to the lowlands. We parked on a corner at 1100m, and followed a minor road up the western side of Monte Marsicano. The walk got off to a bad start when I realised I must have left my gloves at the B&B where we stayed last night. Luckily the weather was slightly overcast, but very warm, with not a breath of wind – in other words, the perfect weather for an idiot who’s lost both his gloves and his sunglasses. For the early part of the walk we found ourselves escorted by a series of large dogs, who only lost interest in us when the trail started to rise. The Italians like their dogs almost as much as Mexicans like their donkeys. We followed an intricate route which weaved left and right through the forest like a drunk on his way home from the pub. This time the route was made more interesting by a number of clearings in the forest which provided fantastic viewing platforms into the valley below. The forest thinned out very gradually until we found ourselves on the treeless upper slopes of Monte Marsicano. For 300m we followed a series of paint-marked posts up a featureless dome-shaped hillside. Very gradually the angle of the slope lessened until two human heads peeped up over the horizon. All of a sudden we were on the summit, and the heads belonged to a couple of hikers sitting on top having their lunchtime sandwich. It was a wide plateau of a summit, marked by a pile of stones and a slightly more conservative cross than we’ve seen on most Apennine peaks. For some reason this point was known as the 2245m main summit of Monte Marsicano, but it wasn’t the highest point on the mountain. The land dropped a little then rose again to three rockier peaks further to the east. 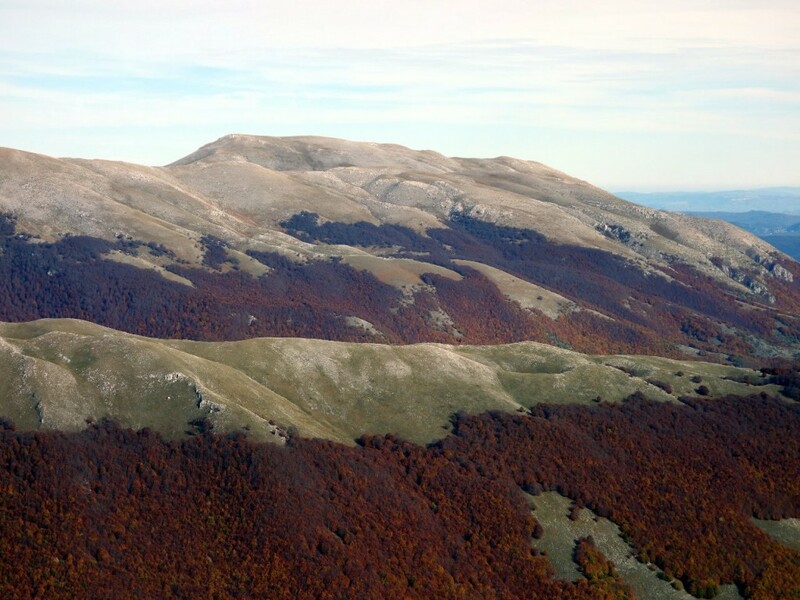 These were the three summits we could see from Monte Greco, and one of them – 2253m Monte Marsicano Est – was in fact the true summit of Monte Marsicano. There were quite a few hikers up here, and most of them seemed content to bag the 2245m peak, so we walked over to the east summit and had our lunch there. Despite being the highest point on the mountain it had neither a cairn nor a cross, but like on Monte Petroso someone had painted the altitude onto a rock. There was another amazing panorama. To the west and south Monte Greco and Monti della Meta were close at hand, and to the east Monte Marsicano’s main summit was even closer. The view to the north was almost as distant as it had been on Monte Greco. The two highest points on its skyline – 2912m Corno Grande and 2793m Monte Amaro, the two highest mountains in the Apennines – couldn’t be more different in appearance: one a dramatic tower of rock and the other a sprawling plateau. 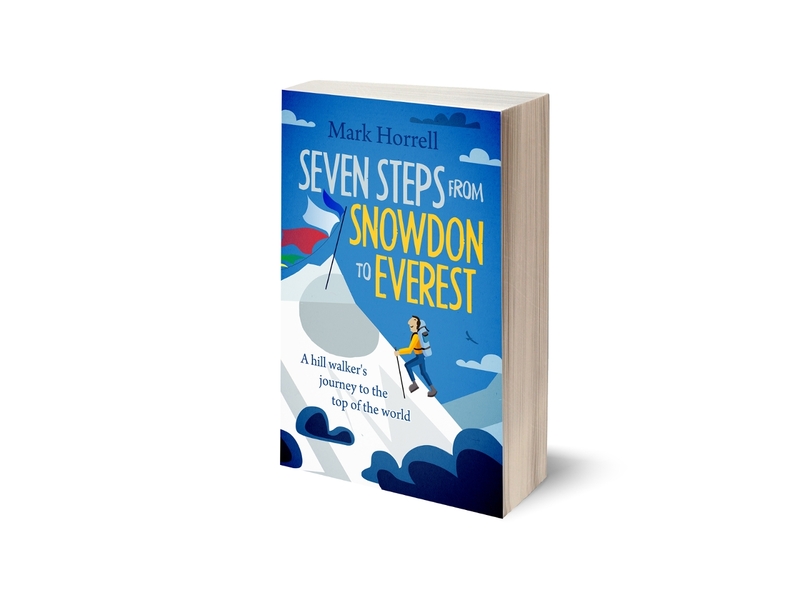 There were many peaks in between that we are yet to climb, but hopefully we will. We rounded off a circular walk by taking the via normale down on the F10 trail, a more direct route back to the roadside, and completed a very satisfying set of mountains. My apologies to those of you who prefer the Everest and high-altitude stuff, but the Apennines are such an amazing place for hill walkers, I’d love to introduce them to more people. 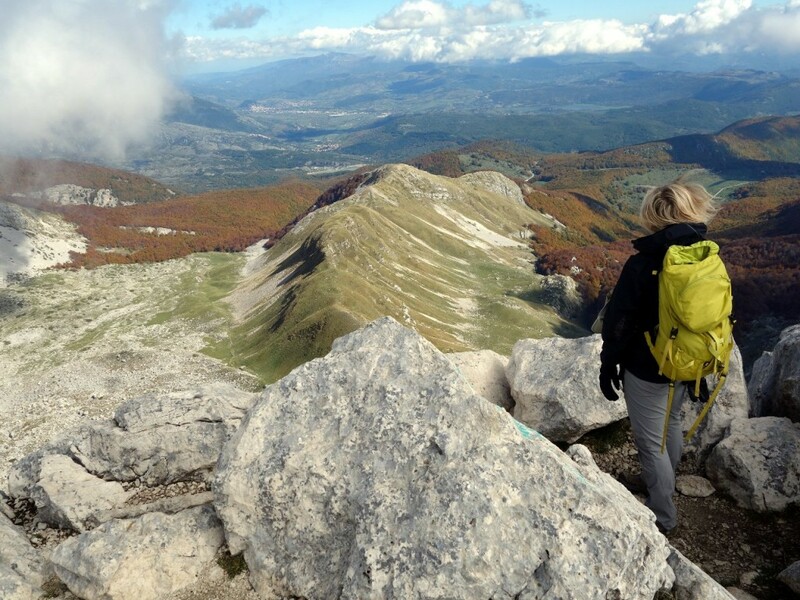 If you have a spare four days in central Italy and enjoy hill walking, then I can wholeheartedly recommend the Abruzzo Quartet (but only if the rules allow)! You can see my photos from all four peaks in my Abruzzo National Park Flickr album. Beautiful. I’ll add those to my already-long list of places to visit in Italy, and would love to see more of your pictures from that trip. Have you done any walking in the Naples/Amalfi region? The Milky Mountains are beautiful and full of trails that overlook either Naples or the Amalfi Coast – both spectacular views. The public walking trail up to the crater of Vesuvius is easy (for an experienced hiker anyway, which I wasn’t when I did it) but only goes halfway around, while experienced hikers can circle the entire crater. Monte Somma, part of Vesuvius’s parent volcano, is a beautiful ridge overlooking the 1944 lava flow with several hiking and nature trails going up and over it. Thanks, that’s useful to know! Yes, at the moment we’re feasting on the Apennines and still have plenty more mountains to explore, but all those places you mention are only a short distance from Rome, and we may well get there one day too.